The Best Libertarian Podcasts from thousands of Libertarian Podcasts on the web using search and social metrics. Subscribe to these websites because they are actively working to educate, inspire, and empower their readers with frequent updates and high-quality information. 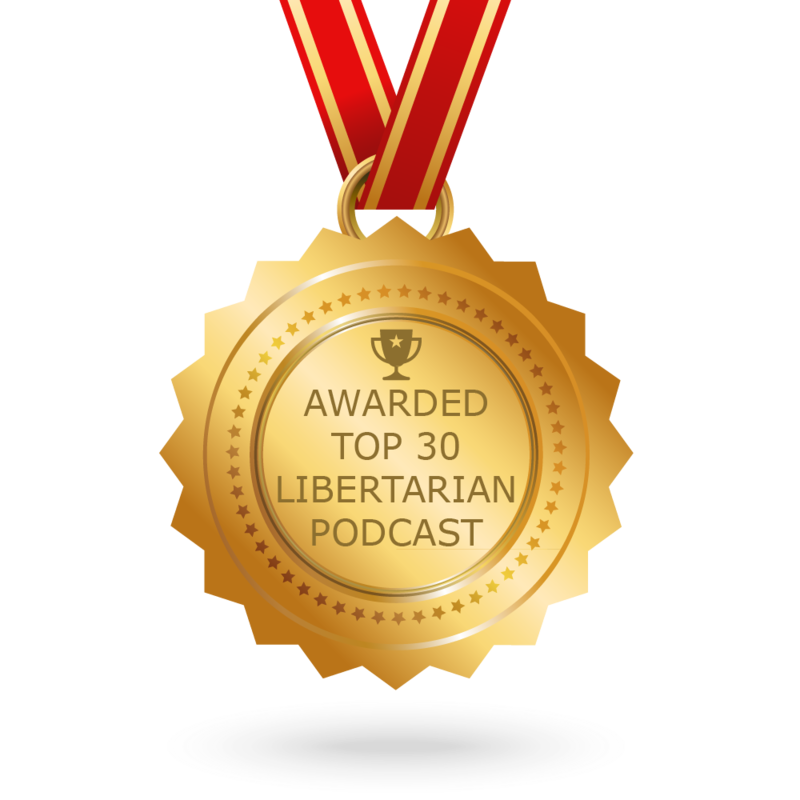 CONGRATULATIONS to every podcast that has made this Top Libertarian Podcasts list! This is the most comprehensive list of best Libertarian Podcasts on the internet and I’m honoured to have you as part of this! I personally give you a high-five and want to thank you for your contribution to this world. Libertarian Podcast newsletter is a comprehensive summary of the day’s most important blog posts and news articles from the best websites on the web, and delivered to your email inbox each morning. To subscribe, simply provide us with your email address. About Blog The Lions of Liberty’s mission is to advance the ideas of Liberty daily and to be your one stop shop for all things related to liberty. Frequency about 4 posts per week. Website lionsofliberty.com/podcast Facebook fans 4,902. Twitter followers 6,099. Indianapolis, IN About Blog Econlib is the Library of Economics and Liberty. It is dedicated to advancing the study of economics, markets, and liberty. It offers a unique combination of resources for students, teachers, researchers, and aficionados of economic thought. Frequency about 15 posts per week. Website econtalk.org Facebook fans 76,486. Twitter followers 18,274. Indiana About Blog We Are Libertarians love politics and news, their mission is to apply libertarian principles to the stories you and your friends are discussing. They examine current events from a libertarian perspective while treating modern politics with all of the irreverence it deserves. Frequency about 3 posts per week. Since Sep 2007 Website wearelibertarians.com Facebook fans 90,983. Twitter followers 7,279. About Blog The LAVA Flow Podcast is a bi-weekly podcast created by Rodger Paxton for the libertarian, anarcho-capitalist, voluntaryist, and agorist communities. The purpose is to entertain and inform anyone who fits within or anyone who is interested in these categories of political thought. This podcast features libertarian news, views, philosophy, events, and locations Frequency about 3 posts per month. Since Jan 2015 Website thelavaflow.com/the-lava-flo.. Facebook fans 2,579. Twitter followers 1,042. Washington, DC About Blog Libertarianism.org Podcast explores the theory and history of liberty. Many people believe that liberty is the core political value of modern civilization itself, the one that gives substance and form to all the other values of social life. Frequency about 4 posts per week. Website libertarianism.org/podcasts Facebook fans 142,927. Twitter followers 82,513. Harmony, FL About Blog The Tom Woods Show serves daily education of liberty. The podcast presents wide range of interviews on history, economics, and society. Frequency about 3 posts per week. Since Feb 2009 Website tomwoods.com/podcasts Facebook fans 80,028. Twitter followers 64,841. About Blog The Cato Daily Podcast allows Cato Institute scholars and other commenters to discuss relevant news and libertarian thought in a conversational, informal manner. This podcast is hosted by Caleb O. Brown. Frequency about 2 posts per week. Website cato.org/multimedia/cato-dai.. Facebook fans n/a. Twitter followers n/a. Texas, USA About Blog The Ron Paul Liberty Report was launched in 2015 by Congressman from Texas. The Liberty Report brings provocative opinion and analysis to the breaking issues affecting our lives and finances. Frequency about 5 posts per week. Since Jul 2015 Website ronpaullibertyreport.com Facebook fans 1,347,305. Twitter followers 2,048. Austin About Blog The Scott Horton Show features information related to Libertarian foreign policy. Frequency about 5 posts per week. Website scotthorton.org Facebook fans 7,280. Twitter followers 18,877. About Blog The Boss Hog of Liberty is a local show with a national impact, because everyone in the world lives in a county similar to theirs. The crew details their lives and gives interview opportunities to the world’s top experts in politics, policy, economics and more. Frequency about 1 post per week. Website bosshog.fireside.fm Facebook fans 1,231. Twitter followers n/a. About Blog Alex Merced Cast discusses on libertarianism, blockchain, bitcoin, crypto, economics and more. Frequency about 3 posts per month. Website alexmercedcast.buzzsprout.com Facebook fans n/a. Twitter followers n/a. About Blog Contra Krugman is an weekly libertarian podcast by Bob Murphy and Tom Woods. They teach economics by refuting Paul Krugman’s New York Times column and also expect special guests like Ron Paul, David Stockman, and more. Frequency about 2 posts per month. Since Sep 2015 Website contrakrugman.com Facebook fans 4,443. Twitter followers 2,285. Intergalactic Prairie Studios About Blog Freedom Feens Podcast is a talk radio show started in 2011 by Michael W. Dean. This podcast has daily chats about constitutional, libertarian, voluntaryist, minarchist and anarchist issues, abuse of authority by police, self-defense, Austrian Economics and more. Frequency about 1 post per week. Since Mar 2011 Website freedomfeens.com Facebook fans n/a. Twitter followers n/a. About Blog The Freedom Report is a podcast that reports on news from a perspective of economic freedom and personal liberty. Frequency about 2 posts per week. Since Nov 2013 Website thelibertarianrepublic.podbe.. Facebook fans n/a. Twitter followers n/a. About Blog The Libertarian podcast features a weekly conversation with Hoover senior fellow Richard Epstein. Frequency about 4 posts per month. Website hooverinstitution.podbean.com Facebook fans n/a. Twitter followers n/a. About Blog The Libertarian Angle is a weekly show by Richard Ebeling and Jacob Hornberger. This podcast talks about liberty. Frequency about 1 post per month. Since Jun 2013 Website libertarianangle.libsyn.com Facebook fans 132. Twitter followers n/a. Indianapolis, IN About Blog Chris Spangle Show brings listeners a daily dose of libertarian common sense on current events. This is a podcast about life, liberty, and the pursuit of happiness. Frequency about 1 post per month. Since Jun 2013 Website chrisspangleshow.fireside.fm Facebook fans n/a. Twitter followers 7,855. About Blog The Brian Nichols Show is a political show which discuss about climate change, gun rights, abortion, or big issues like discussing the fundamental role of government. It discusses the news objectively to help educate, enlighten, and inform our audience. Frequency about 1 post per week. Since Dec 2017 Website briannichols.fireside.fm Facebook fans 203. Twitter followers 4,828. About Blog Welcome to the Pursuit Podcast hosted by Tess Terrible. It is a podcast about government action and individual liberty. Frequency about 1 post per week. Website libertarianism.org/podcasts/.. Facebook fans n/a. Twitter followers 266. About Blog Free Thoughts Podcast hosted by Aaron Ross Powell and Trevor Burrus. It is a weekly show about politics and liberty, featuring conversations with top scholars, philosophers, historians, economists, and public policy experts. Frequency about 2 posts per month. Website libertarianism.org/podcasts/.. Facebook fans 1,749. Twitter followers 3,011. About Blog Peter Schiff is an economist, financial broker/dealer, author, frequent guest on national news, and host of the Peter Schiff Show. Listen to his show for latest insights on the fundamentals behind the news, and get the facts on the global economy. Frequency about 1 post per week. Since Sep 2014 Website schiffradio.com/the-peter-sc.. Facebook fans 126,087. Twitter followers 132,527. About Blog The Libertarian Christian Podcast explores the intersections of Christian faith and libertarian thought. Frequency about 2 posts per week. Since Feb 2017 Website libertarianchristians.com/po.. Facebook fans 8,857. Twitter followers 754. About Blog The Launch Pad Media is a news and entertainment company for those who promote and seek a lifestyle of independence and liberty. Frequency about 6 posts per week. Website thelaunchpadmedia.com Facebook fans 646. Twitter followers 61. Las Vegas, NV About Blog The Lolberts is a podcast featuring information related to liberty, news and politics. Frequency about 2 posts per month. Since Sep 2015 Website lolberts.com Facebook fans 293. Twitter followers 337. San Francisco About Blog Bob Zadek reviews current events from a purely libertarian perspective, smal government, limited federal powers and more. Frequency about 4 posts per month. Website bobzadek.com/past-shows Facebook fans 1,664. Twitter followers 2,604. Denver, CO About Blog Welcome to Liberty Entrepreneurs Podcast by Ashe Oro. It is a platform to explore the idea of building freedom. He illustrates this by interviewing liberty minded entrepreneurs who are building their own, free and flexible lifestyle. Frequency about 2 posts per month. Website libertyentrepreneurs.com/pod.. Facebook fans n/a. Twitter followers 1,408. About Blog Libertarian socialism is a group of anti authoritarian political philosophies inside the socialist movement that rejects the conception of socialism as centralized state ownership and control of the economy. Frequency about 1 post per month. Website libertarian-socialism.org/po.. Facebook fans 315. Twitter followers n/a. About Blog Essential Libertarianism provides libertarian content by their episodes. Frequency about 3 posts per month. Website essentiallibertarianism.com Facebook fans n/a. Twitter followers n/a. Georgia, USA About Blog Jen the Libertarian Podcast features political and social commentary from a libertarian woman’s perspective. Frequency about 1 post per week. Since Mar 2018 Website jenthelibertarian.com Facebook fans n/a. Twitter followers 4,879. The post Top 30 Libertarian Podcasts You Must Subscribe and Listen to in 2018 appeared first on Feedspot Blog.